Yet another Mars review! It takes time for new candy to work its way into my local grocery stores, and it looks like all the Mars products hit at once. Again, it's a familiar product with new fusion flavors. Starburst GummiBursts haven't been around as long as some other classic Mars fruit candies like Starburst fruit chews and Skittles, but they seem to be doing well. 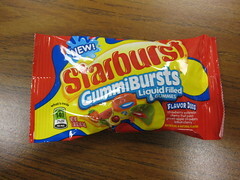 Flavor Duos is the third variety of GummiBursts (after regular and sour) I've seen, and there are probably more. There were four flavor combinations: Green Apple Strawberry, Cherry Fruit Punch, Strawberry Watermelon, and Lemon Cherry. Green Apple Strawberry was dominated by the crisp, tart green apple flavor. It was good, but I could hardly taste the strawberry! 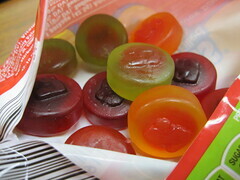 The firm texture of the gummy part made for an enjoyable chew. Cherry Fruit Punch had a yummy classic red fruit snack taste. It was both tart and sweet with a hint of a vitamin flavor. Also, the colors of this piece reminded me of a red blood cell. Strawberry Watermelon was the star of the bunch. The watermelon center was sour and fantastic, and it went well with the fairly authentic flavor of the strawberry gummy. Lemon Cherry had the same zesty lemon flavor as a regular lemon Starburst, but the cherry center tasted a bit medicinal to me. Still, this one was enjoyable, it just wasn't my favorite (and lemon flavors are usually a sure bet for me). All in all, these GummiBursts were sweet but not cloying, tart but not sour, and the slightly firm, bouncy texture of the gummies was just right. The flavor combinations weren't all that new or exciting, but the Strawberry Melon and Cherry Fruit punch were particularly well done.